Do you like Free Stuff? 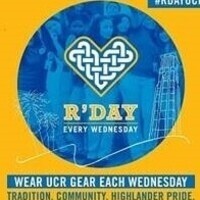 Are you wearing UCR gear on R'day? If so, come down to the Belltower to get a tartan soul shirt! All you have to do is post a picture of yourself on social media with the UCR gear you are wearing right now and the hashtags #rdayucr #tartansoul, show it to us uploaded and it is yours! While supplies last.